Most swords offered today are interpretive copies of antiquities from feudal Japan. They were made for warrior"s of small stature who seldom rose above five and a half feet. As skillfully designed as these swords are, they may not be perfectly suited for the twenty first century warrior, who benefited from contemporary advances in childhood nutrition and health care and grew up to be a substantially taller, stronger, and more athletic version of his historical counterpart. Most noticeable are the distinctive teal-green silk cord-wrap and black samÃ© (ray skin) used on the handles and the black iron furniture that bears the dragonfly motif. Also, the polished blades are more strongly curved than our Imperial blades and terminate in a long "œiris leaf" point for maximum cutting and slashing potential. Additionally, these swords come with two protective bags. There is a BLUE TRAVEL BAG and an intricately decorative display bag that"s made from the finest heavy silk metallic brocade. This sword is amazing, not like the crap you buy at the flee market. It's very well balanced, has a stylish blood groove and comes razor sharp out of the box. I'm impressed and feel my money was well spent. This blade is the highlight of my collection. Incredibly beautiful, very tight. Heavier and more curved than the traditional katana, it works well for larger people like me at 6'4". The balance is phenomenal, feels so natural in your hands. All the accents are superb and the finish is flawless. Again, True Swords has made a great purchase even better, I have found no reason to buy anywhere else. Nice, sharp edge, durable construction, and will last a long time with proper maintenance and care. I gave a four out of five because there were some dark marks along the edge of the blade when received. I contacted TrueSwords, and they were eager to resolve the issue. The only other problems I had were that the Kashira is a tad loose. It rattles a bit, but does not affect performance. If you are going to retie the Sageo, throw away the Shitodome in the Kurikata. The ones sent with mine damaged the Sageo. I did not retie the Tsuka Ito, so I am not sure about the Shitodome in the Kashira. They appear to be of similar quality. Excluding these problems, the Ito is nice and tight, the Tsuba is of excellent construction, the Iris Leaf Kissaki looks beautiful in the light, and the polishes done to the Hi and between the Shinogi and Mune are great looking. You can't tell from these pictures, but the Mune actually tapers between the large Hi and the Kissaki. It is a really interesting design. The Kashira, Fuchi, and Tsuba were not the ones shown in the pictures, but I personally like the ones I received better. Overall, an excellent blade. I am slightly afraid of using my blades on Tatami mats, but I may have to try this out on one. If you plan to remove the Tsuka, replace the Mekugi. They aren't bad, but I just didn't like the way they were ground down to the ray skin. Full tang, double pegged construction. If you want a truly unique blade, I would recommend this one. 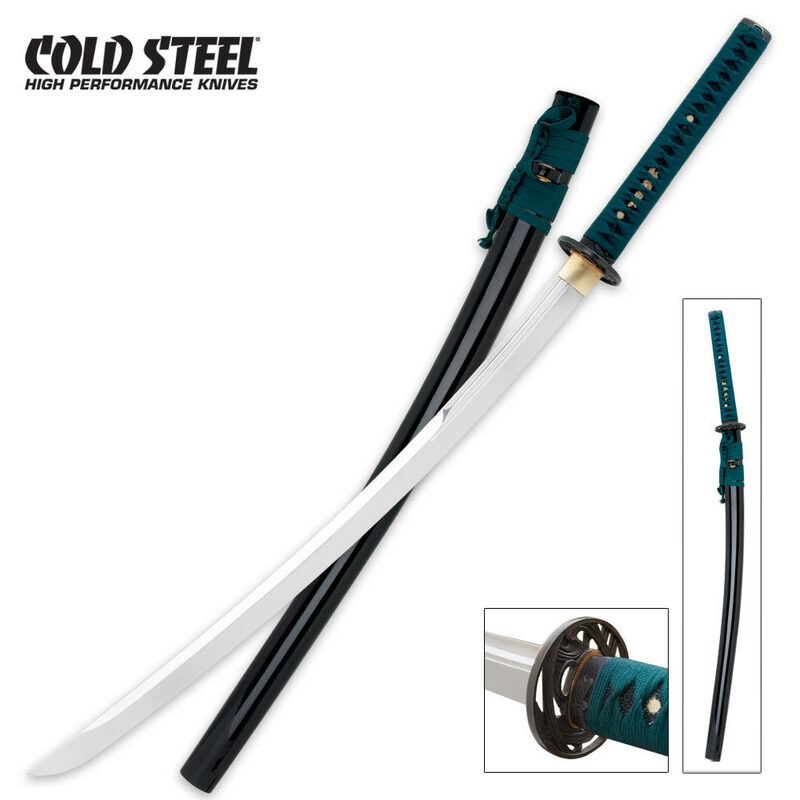 One of my favorite katanas and I have some that are a lot more expensive. Even though the blade is monosteel and not differentially tempered it is my favorite shaped blade. I also find that the cold steel katanas seem to cut straw mats very well. The tsuka wrapping is tight and attractive. The only thing I would point to that wasn't compeletely positive is tha the blades are a little bit heavier than my other katanas. I would definitely recommend these swords. Very beautiful Katana. I wasn't too sure about purchasing this because of the cost, but now I can say that I don't regret it. It is pricey but well worth its money. The blade is very nicely made and extremely solid and sharp. The Katana as a whole is very solid too. If you've got the extra money, go for it. sword is great ! picture doesn't give it's curve justice. but had small round nick on scabbard, but the sword is good.